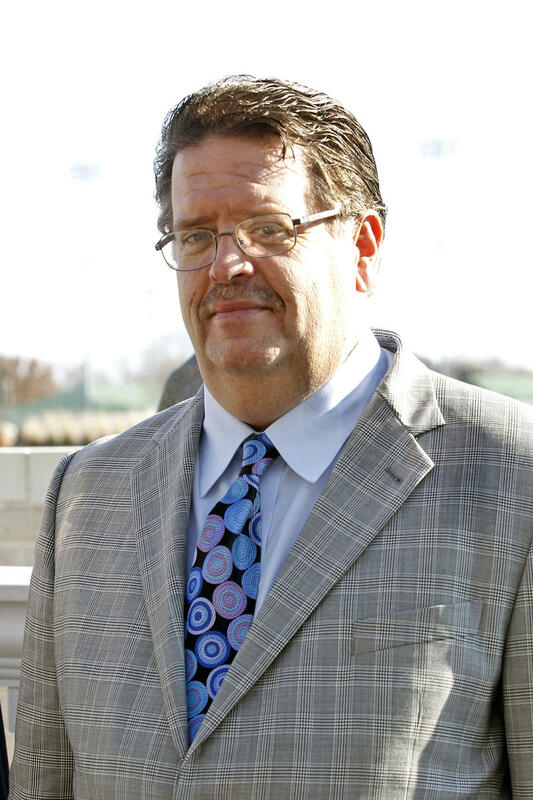 Trainer Dale Romans' Birdathewire won the Grade II Gulfstream Park Oaks and Forward Gal before she finished fifth in the Longines Kentucky Oaks (GI) (Reed Palmer, Churchill Downs). 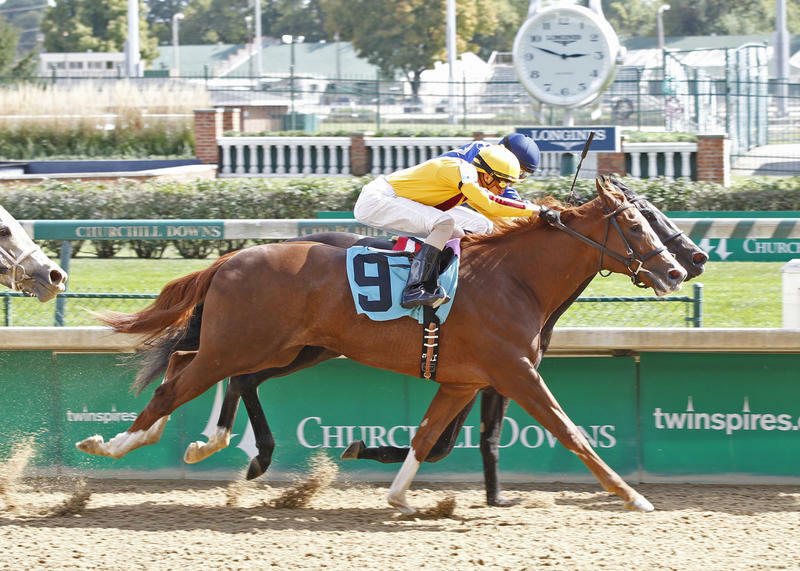 Come-backing Grade II winners Birdatthewire, Keen Pauline and Gold Medal Dancer headline a field of eight fillies and mares entered for Saturday’s 30th running of the $200,000 Chilukki Stakes (Grade II) at Churchill Downs. Forum Racing IV’s Birdatthewire and Stonestreet Stables LLC’s Keen Pauline are 3-year-old fillies that will face elders for the first time and hail from the barn of trainer Dale Romans. Birdatthewire, winner of the Forward Gal (GII) and Gulfstream Park Oaks (GII) in South Florida early in the year, will be making her first start since finishing fifth in the $1 million Longines Kentucky Oaks (GI) when she was 5 ¼ lengths back of winner Lovely Maria. Black-Eyed Susan (GII) winner Keen Pauline most recently finished ninth of 11 in the $1 million Cotillion (GI) at Parx Racing on Sept. 19. Romans saddled last year’s Chilukki winner Molly Morgan and also won the race in 2004 with Halory Leigh. A win on Saturday would tie Rusty Arnold’s record for most wins by a trainer in the race. Gold Medal Dancer, a 5-year-old Pin Oak Stable LLC homebred, hasn’t raced since finishing sixth in the $200,000 Fleur de Lis Handicap (GII) on June 13. In March, she defeated 2014 Kentucky Oaks winner Untapable by a half-length to win the $294,000 Azeri Handicap (GII). The complete Chilukki field from the rail out (with jockeys): Birdatthewire (Corey Lanerie), Black-Eyed Susan third Ahh Chocolate (Brian Hernandez Jr.), stakes-placed Serene Melody (Julien Leparoux), Open Mind winner Spelling Again (Shaun Bridgmohan), Grade III-placed Ambusher (Chris Landeros), Gold Medal Dancer (Luis Quinonez), Keen Pauline (Miguel Mena) and multiple stakes winner Shanon Nicole (Robby Albarado). Known as the Churchill Downs Distaff from 1996-2004, the Chilukki was renamed in 2005 to honor Stonerside Stable’s graded stakes-winning filly trained by Bob Baffert. The daughter of Cherokee Run made four starts at Churchill Downs, all of which were victories. Chilukki won the 2000 edition of this race in what would be her final start. COX HAS HIGH FOR CHILUKKI ENTRANT SPELLING AGAIN – Sea Jay Racing LLC’s Spelling Again will take another shot at a graded stakes triumph in Saturday’s $200,000 Chilukki (GII). Last time out, the Pennsylvania-bred daughter of Awesome Again was a troubled fourth in the Thoroughbred Club of America (GII) at Keeneland, her lone start against such caliber. Cox believes the Chilukki to be most logical spot for Spelling Again, whose last victory came two starts ago in the Open Mind at Churchill Downs in September. Cox is looking ahead with Spelling Again, stating that the Humana Distaff (GI) on the Kentucky Derby undercard is the long term goal for next year. Jockey Shaun Bridgmohan, who guided the filly to her Open Mind victory in September, returns to the irons. AHH CHOCOLATE SEEKS GRADED STAKES GLORY IN CHILUKKI – Stoneway Farms’ Ahh Chocolate is hoping to hand her first graded stakes victory with a start in Saturday’s $200,000 Chilukki (GII). The daughter of Candy Ride’s last victory came at Churchill Downs during the September Meet against older fillies and mares against allowance company, which she won under a hand ride by four lengths. The Chilukki will be the 3-year-old filly’s second time facing older fillies and mares. Her most recent start came in the Raven Run (GII) at Keeneland where she finished eighth beaten 4 ½ lengths behind eventual winner Sarah Sis. Brian Hernandez, Jr., the pilot in all but one of Ahh Chocolate’s seven career starts, will be aboard for Saturday’s race. CASSE REFELCTS ON BIG WEEKEND, TALKS PLANS WITH PROMISING TWO-YEAR-OLDS – Breeders’ Cup weekend was without question a big one for the Casse barn. Not only was the trainer finally able to taste Breeders’ Cup success for the first time, but did so twice last week. Gary Barber’s Catch A Glimpse was victorious in Friday’s Breeders’ Cup Juvenile Fillies Turf (GI) while Robert Masterson’s Tepin beat males in the Breeders’ Cup Mile on Saturday, being only the fifth filly or mare to do so. 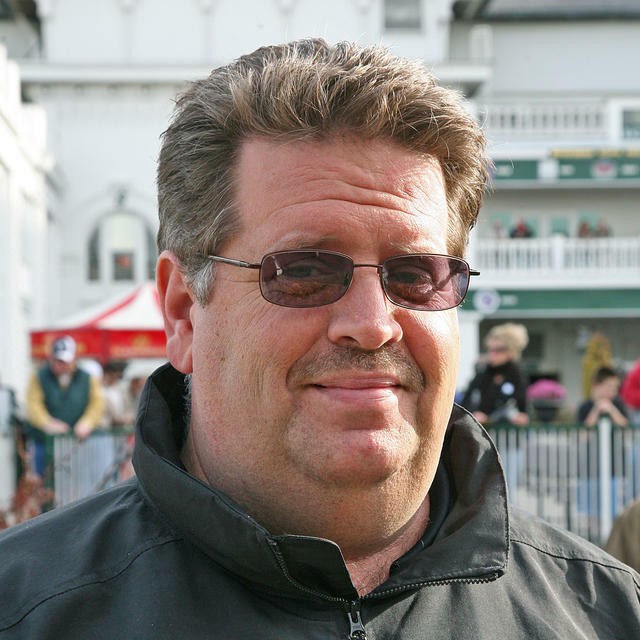 Assistant trainer Norman Casse, who oversees his father Mark’s Churchill string, reflected on this accomplishment and went on to discuss other accomplishments throughout the month of October outside of the Breeders’ Cup victories. “The Breeders Cup races are very hard to get into to begin with and they’re very hard to win,” Norman Casse said. “It’s been about two or three that we probably should have won with better trips so it wasn’t like we had been running bad – we just couldn’t get over the hump. It wasn’t all good times for the Casse barn this year, however. The stable suffered through a frustrating summer meet at Saratoga where Casse won three races from 42 starts and ran second eight times, two of which were with Tepin. As many American trainers would agree with, the Breeders’ Cup turf races can often times be the toughest to win for trainers based in North America because of such a strong European presence in such races. This, according to Casse, makes the barn’s two victories that much more special. While both Casse-trained fillies are enjoying some down time at Moon Shadow Farm in Ocala, Fla., Casse says that a 2016 campaign in the process of being mapped for both horses. If all goes well for Tepin, she could potentially face the boys once more on the Keeneland lawn in next year’s $300,000 Makers 46 Mile (GI) before racing in the $300,000 Churchill Distaff Turf Mile (GI) on Kentucky Derby weekend. Casse went on to discuss plans for some of his 2-year-olds that competed in the Breeders’ Cup last weekend. Conquest Stables’ Conquest Big E, eighth in the Breeders’ Cup Juvenile (GI), and John C. Oxley’s Airoforce, second in the Breeders’ Cup Juvenile Turf (GI), could make their next starts on closing weekend in the $200,000 Kentucky Jockey Club (GII) on Nov. 28. DOWN THE STRETCH – Kaleem Shah’s 3-year-old Dortmund recorded a half-mile workout in :48.40 at Santa Anita on Wednesday morning, which was the sixth-fastest of 32 at the distance. Hall of Fame trainer Bob Baffert has mentioned the $500,000 Clark Handicap Presented by Norton Healthcare (GI) on Friday, Nov. 27 as a possible next start. He won the $75,580 Big Bear Stakes at Santa Anita on Oct. 24 by 1 ¾ lengths, which was his first start since a fourth-place finish in the Preakness (GI). … Thursday (Nov. 5) is the first of two Senior Days at the Fall Meet that offer discounted Millionaires Row tickets to ages 60 and up. The other event is scheduled for Wednesday, Nov. 18. … Presented by Kroger and in partnership with Kosair Children’s Hospital, Family Adventure Day will be held Sunday (Nov. 8). While adults enjoy the racing action, the kiddos will relish numerous activities throughout the day. Tickets for adults and children age 3 and up are $8 in advance online at ChurchillDowns.com or $10 at the gate. One dollar of every event ticket will benefit Kosair Children’s Hospital. Family Adventure Day tickets include admission and access to the Courtyard (Section 119) for trackside viewing plus a wristband to access for all activities beneath the Grandstand Terrace.